Ever since I decided to make my life less crappy with my own little Happiness Project, errands, like finding a pumpkin for my kids this Halloween season, take on a different meaning. This pumpkin is no longer a grocery item at the Farmer’s Market down the street. 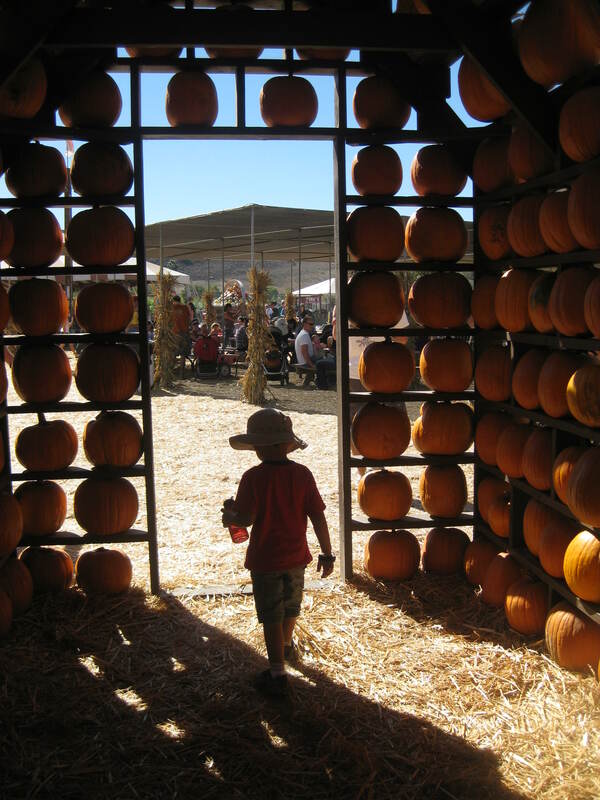 This pumpkin search becomes a project — one that requires a family field trip to the farm. 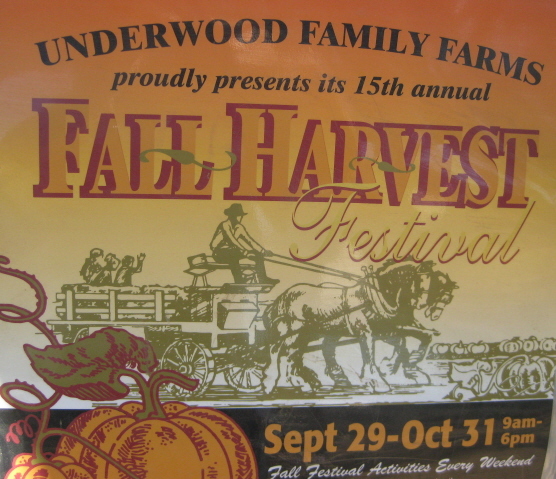 This was our first outing to the Underwood Family Farms and it proved to be an awesome country adventure as the Fall Harvest Festival was in full swing. Granted it took us over forty minutes to get there and my kids were running out of patience, but we made it — all in one piece. 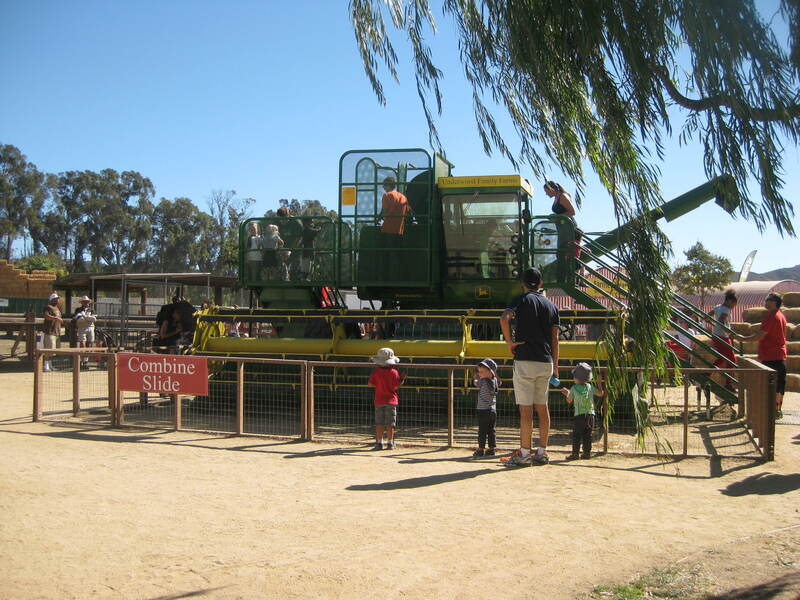 We started off with the Combine Slide, something that my four-year old is very familiar with courtesy of one of his favorite shows Mighty Machines. We hung out here for a while and despite the massive slathering of Coppertone we got a nice tan. This was followed by a little climbing. 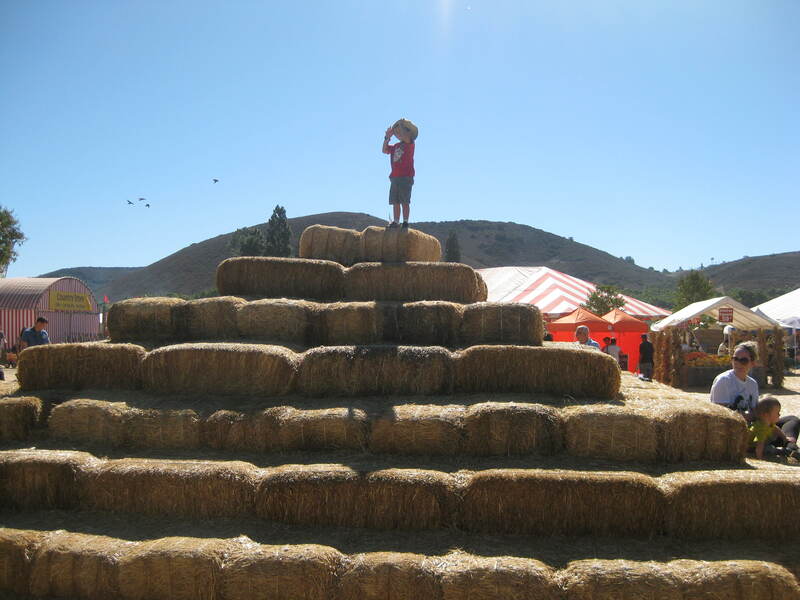 My son found the altitude of the hay stacks quite amazing, my daughter thought hay throwing was even more amazing. 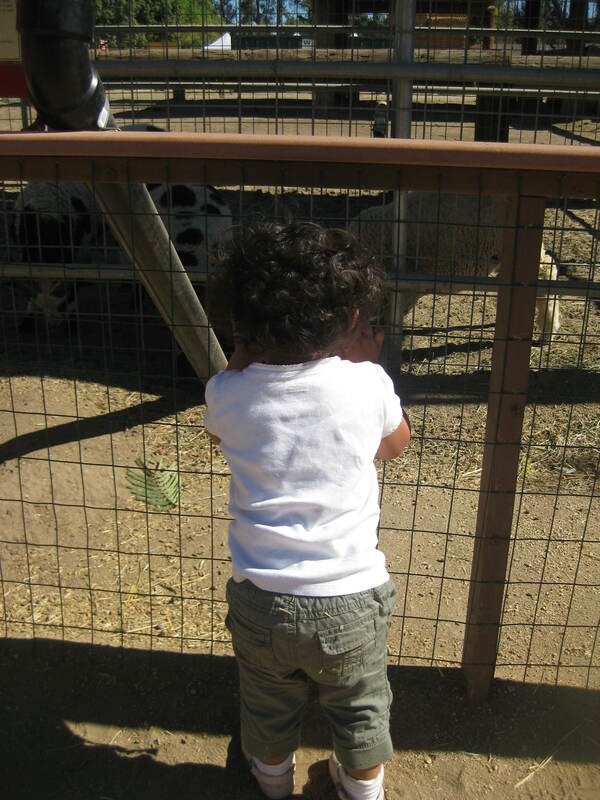 Checking out the farm scene. After all that activity, we decided to mingle with farm animals and my daughter decided to chat up a storm with the sheep. They were having a lengthy conversation — the kind where she screams and laughs, and they just stare. 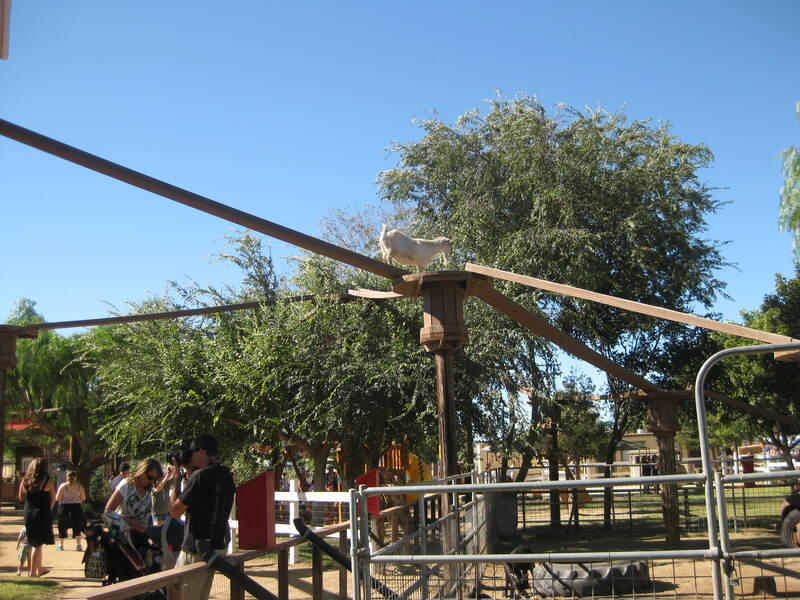 While the kids continued making friends with all the four-legged farm residents, I happened to glance up at the sky and notice this one goat … just thinking outside of the box when it came to walking around the farm. I was tripping out on his balancing skills and his I-got-this! high-beam walking routine. He’d rock the Olympic gymnastic stage. 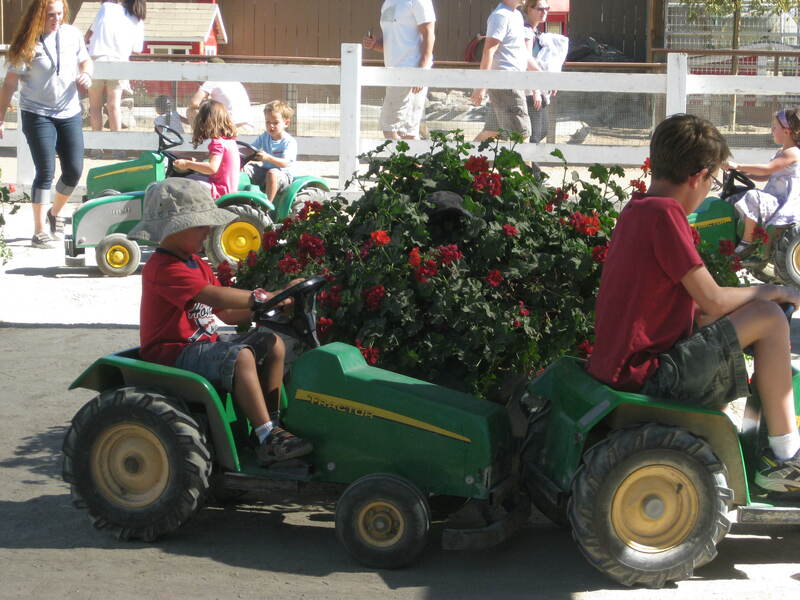 Some kid causing traffic … and my son helping him out. After all that walking around, my son decided to get behind the wheel. He hates traffic and managed to steer clear of it. But he realized that traffic jams happen on the farm too. But with his city mentality, he was able to get out of that one soon enough. The Beginning of the maze. After a couple of rides on his mini John Deere tractor, we decided to take the adventure out to the corn. With the sun beating down on us and the smell of food in the air I was hoping we’d get through it pretty quickly. I mean I went to college. I could do this. We saw plenty of these signs on the way. Getting lost in the maze cracked us up. It took us over twenty minutes to get through it. However, we never made it to the exit. We looped around and then left through the main entrance. Woo-Hoo! Let’s hear it for the college grad. For this valiant effort I decided to buy myself a shaved Hawaiian Ice. A large. My son waving the flag. Feeling corn-maze victorious, we headed over to one of the main events: The Pig Races. I had never been to one of these before and apparently it was a very popular event as the stands were packed with corn-on-the-cob eating spectators. 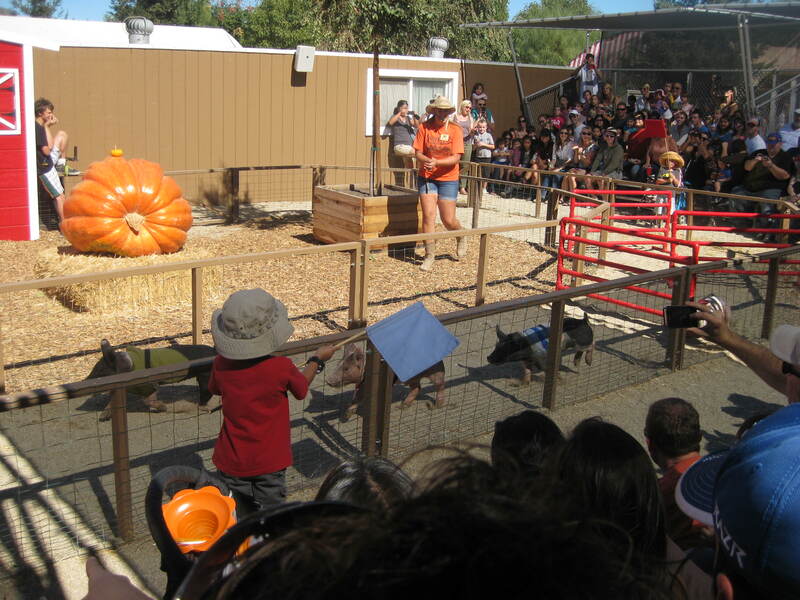 We witnessed these spry three-month old pigs sprint through a small obstacle course, and we cheered on the winner. I was happy when they asked for volunteers, because my son became one of the chosen ones. He was the blue flag holder and proud of it. He was pretty excited to see his pig win a race. Other than the mini train tractor ride around the farm, his pig coming in first place was the highlight of his day. However, the sun was getting hotter, and my one year-old was getting tired of all the hay and corn, so it was off to search for the pumpkin. On a mission for The Great Pumpkin. 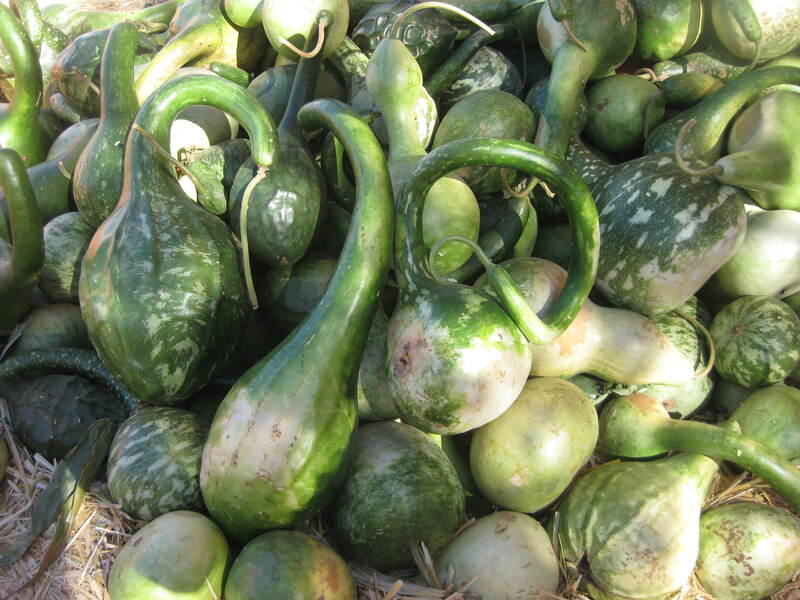 We came across this funky-looking squash and my son decided it was not Halloween-worthy, so we left it at the farm, and continued our search. 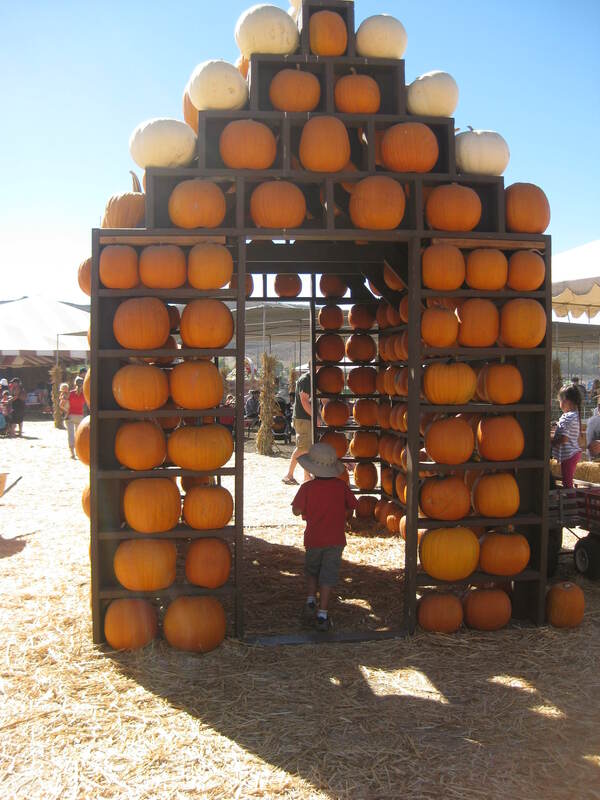 And wouldn’t you know it … just as we reached the ginormous pumpkin patch, my camera battery died. So most of the pumpkin-choosing memories remain tucked away in my Guat brain. But it’s a good archive, I got lots of pictures stored up in there. So there were no worries … after all we didn’t go up there to take pictures, but to have a good time and sure enough, we did. 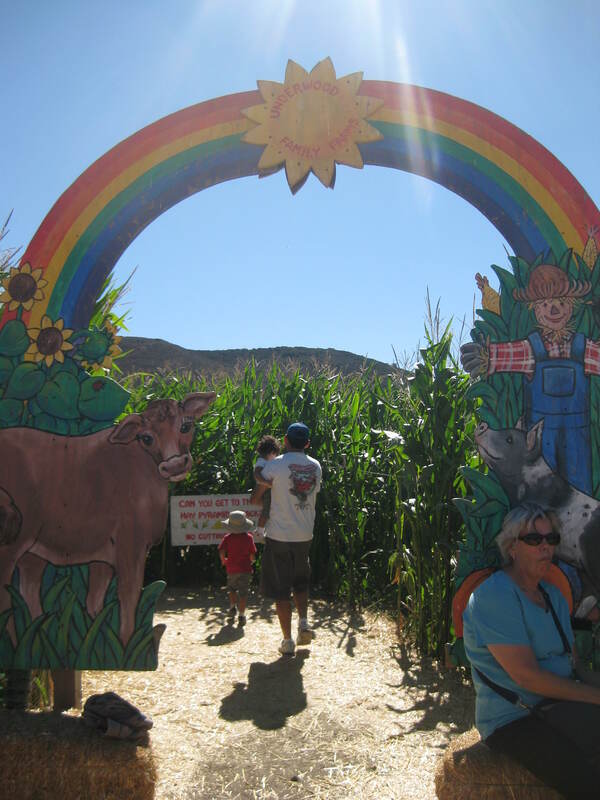 Who knew pumpkins, corn on the cob, pig races and Hawaiian Ice would make for a Happiness Project moment. But it did. 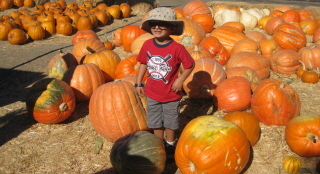 Pumpkin patches rock, just wish they were a little bit closer. What a wonderful day and I love the photos! It looks like it was well worth the drive. Happy Halloween! Great photos, and it looks like your little boy had a load of fun. I’ve NEVER heard of pig racing before. Hilarious idea. 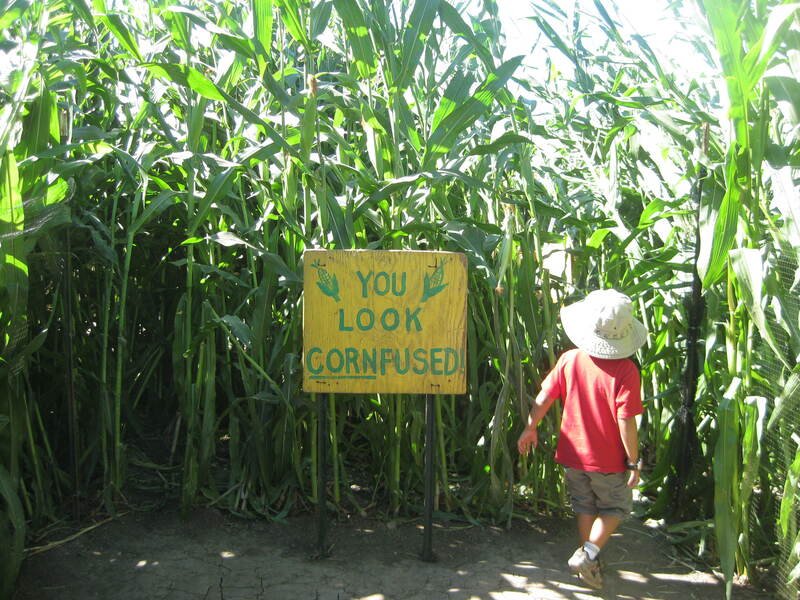 😆 I’d never go in a maze on my own. I’d never find my way out again. 🙂 Happy Halloween to you and your son. I’d give him candy if he knocked at my door.